I've recently needed to create an invoice, so I thought, ah, perfect chance to try out this Writely, see what it is made of. Sadly, not much it would seem. I don't want to be down about Writely, it certainly seems to have some cool collaboration and sharing features. But in terms of a general use word processor, it falls short. All I wanted to create was a simple invoice. So I fired it up, start typing away, and all seemed well. I added a table and that seemed relatively painless. Then I noticed Writely kept adding spaces to empty lines, and I couldn't tab. Little things, but annoying none the less. Fine I thought, I'll save it out to Open Office and edit it in there. Only once I did that things really cocked up. Opening it in Open Office I was presented with crazy spacing I hadn't had in Writely, and took me a fair while to figure out how to remove. So I decided, after I had fixed it in Open Office, that I would do the translation acid test on Writely. You know, take a phrase like “Fish swim in the ocean”, translate it from English to French and back again, and see what you get, only with Open Office and Writely, and my invoice being the phrase. (You get “The fish swims in the ocean” on FreeTranslation.com by the way.) The results are the screen grabs below. 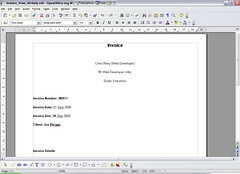 Screen 1 is the document, formatted as I'd like in Open Office. 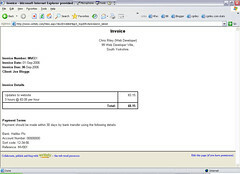 Screen 2 is the same document uploaded to Writely; not too bad, but it has mucked up the invoice number bolding. 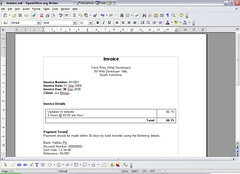 Screen 3 is the same document saved back out to Open Office. What the hell has Writely done to it?! The spacing is all over the shop. If this was an important report I'd just collaborated on, I'd be annoyed, annoyed as hell. I hope they can sort their conversion process out, because right now, that really isn't usable. Permanent link for "Writely disappoints"